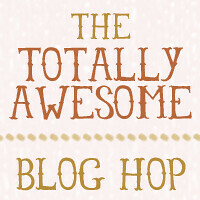 Hello, and welcome to the Totally Awesome Blog Hop!! This marks the six month anniversary of this amazing blog hop. Our aim has been: broadening circles, encouraging community, and making new friends. We have definitely accomplished all this and more! Because of its success, this blog hop we co-created will be an All-Stars edition. Meaning this time around, there are ten amazing hosts who have all already co-hosted, love it, and want in again!! As always, the hop will be linked between all ten sites, ensuring everyone's links get seen and clicked. We want our audiences to get to know each other! Our goal is community building between like-minded folks, and this is a place for of people to meet, make friends, and expand their following! #1 Visit all ten hostesses sites, and follow any four hostesses of your choosing! We love you, and thank you!